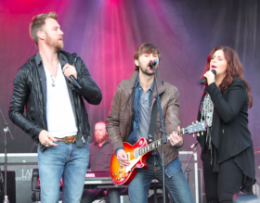 Lady Antebellum’s Hillary Scott is working with her family on a brand new gospel album! Charles Kelley is currently working on his own solo project and he said Lady Antebellum were “taking a break”, but it seems Hillary isn’t staying away from music for too long! Hillary’s mother, Linda Davies, has had a rather successful career in music herself, winning a Grammy Award and a CMA Award for her duet with Reba McEntire, ‘Does He Love You’. Linda said “As parents, it’s fun to be able to be involved in a project with both of our children”. As of yet, no release date has been announced, but we will keep you updated!